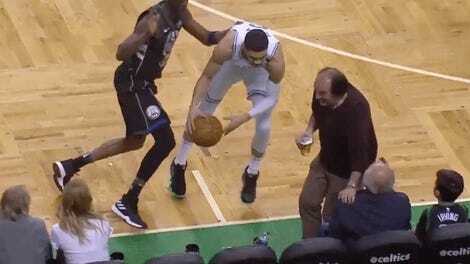 Player of basketball Kyrie Irving has a fondness for cereal, it would seem. At least, that’s what the latest designs for the Kyrie 4, his signature shoe, would indicate. 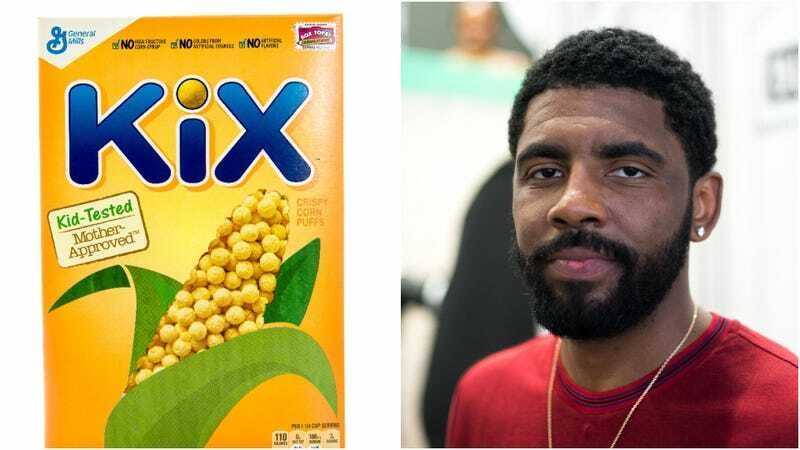 Uproxx reports that Irving modeled a Wheaties-inspired pair while promoting his madcap basketball romp and Pepsi commercial adaptation Uncle Drew this summer, and the newest colors are further variations on a theme. The “Cereal” pack includes three colorful shoes inspired by Kix, Lucky Charms, and Cinnamon Toast Crunch. They look cool. So noted. They are also just kind of... weird? No? Just me? The Lucky Charms pair makes the most sense to me. They’re appropriately colorful, and the print on the insoles is playful and low-key appetizing. It also allows for plenty of “somebody’s after me Lucky Charms” jokes and I can appreciate a piece of footwear that’s also a set-up for a punchline. The Kix and Cinnamon Toast Crunch designs are harder to unpack (and to be fair, if one had to guess, one might suppose that the actual reason behind the partnership is “money”). The Kix/kicks jokes, again, just write themselves (see headline), but those colors sure aren’t Celtics colors. They are, in fact, most similar to these colors. Stroke your goatee thoughtfully at that one. Perhaps it’s that I was never a Cinnamon Toast Crunch kid, but that’s the pair I find hardest to wrap my mind around. It looks like there’s a bit of a paint-splatter effect happening on the swoosh and the other white chunks, and it seems those, per Uproxx, are the colors found in the CTC logo. But it’s pretty subtle, and beyond that, while the gold-ish color might look great in person, it does look awfully flat in the photo, does it not? The insole print is also the least appealing of the three. The shoes, which should retail for $120, will be available in the Nike Snkrs app starting August 11, but pop-up shops began on August 4 for those in Southern California and the Northeastern United States. We cannot speak to how they taste—like expensive sneakers, probably—but they look cool. And I must admit that if the great Damian Lillard of my beloved Portland Trail Blazers designed, like, a craft beer-inspired line of the Dame 4s I would be all about it, so there’s that. But most importantly, someone get Irving a bowl of cereal, he apparently has a craving.